The CoolRunner-II 32-macrocell device XC2C32A is designed for both high performance and low power applications. This lends power savings to high-end Communication equipment and high speed to battery operated devices. Due to the low power stand-by and dynamic operation, overall system reli- ability is improved This device consists of two Function Blocks interconnected by a low power Advanced Interconnect Matrix (AIM). The AIM feeds 40 true and complement inputs to each Function Block. The Function Blocks consist of a 40 by 56 P-term PLA and 16 macrocells which contain numerous configura- tion bits that allow for combinational or registered modes of operation. By Xilinx Corp. This is one package pinout of XC2C32A,If you need more pinouts please download XC2C32A's pdf datasheet. 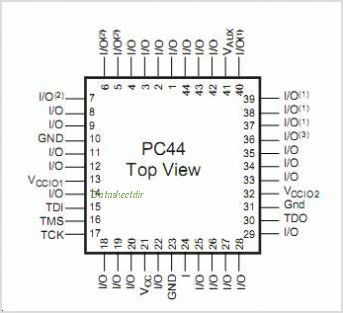 XC2C32A circuits will be updated soon..., now you can download the pdf datasheet to check the circuits!